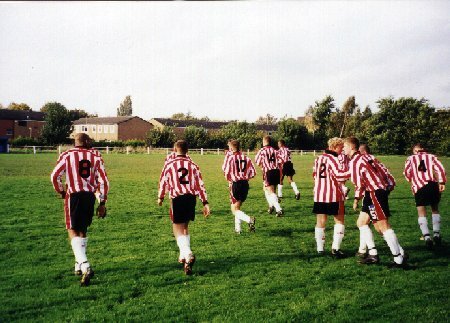 Altrincham's Youth side are managed by George Heslop and play in the Bolton and District Amateur Football Combination (North West Youth Alliance Under-18s' Premier Division). L to R: The team warms up before the game; Paul Monaghan's penalty hits the back of the net. Click images to enlarge them. The fixture list had suggested that Morecambe would be today's opponents but it turned out that the opposition were Walton-le-Dale. The visitors arrived late and the game therefore kicked off 14 minutes late. George Heslop fielded Schofield and Daniel up front, with Crowther, Tilley, Kennedy and Monaghan in midfield, Howe and Claffey were the centre-backs, with Leahey and Lewis the full-backs. Altrincham started well and deservedly took the lead after 17 minutes when the impressive Mario Daniel ran in on the opposition keeper to score. 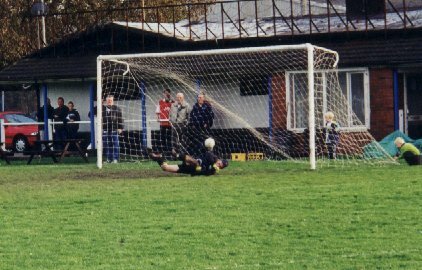 The visitors grabbed an equaliser nine minutes later after Levi Kennedy made an uncharacteristic error and Newbrook was left in an impossible position. However, Altrincham responded with Kennedy, Monagahan and Daniel all playing well and after an awful mis-pass by the opposing left-back, Daniel crossed for Schofield to tap the ball home from close range after 30 minutes of play. Schofield netted the third goal when the visitors' keeper failed to hold his shot, three minutes before the interval. The visitors improved their performance after the interval and were unlucky not to score after 59 minutes when their number nine did well to get into a shooting position only to see his well-hit strike come down off the crossbar and out of the goal. This was a rare threat to Newbrook's goal and Altrincham spent most of the rest of the game on the offensive. Monaghan played some fine football in midfield whilst Howe marshalled the defence well. After 67 minutes Schofield was substituted by Wright who went on to have a good game himself. Altrincham got their fourth when Mario Daniel was pulled down in the penalty area, to the right of goal. Monaghan coolly slotted home the penalty (72 mins). Two minutes later Kennedy was substituted as Altrincham played out the game in dominant fashion to retain their unblemished league record. This was a very entertaining game with the Altrincham side functioning very well as a unit. There were good performances in each department of the side, from the vociferous Dale Newbrook to the front-line. Dale has obviously been taking lessons in voice projection from first-team keeper Stuart Coburn. George Heslop is clearly doing a fine job with the Youth XI and it will not be surprising if several of the current side follow Otis Thomas into the higher-level sides at Moss Lane. The next scheduled home game is against Rossendale United on 12 November at the same venue (Wythenshawe FC, Timpson Road, Baguley- next to Tesco), kick off is at 2pm. The Manager's reportReproduced below is George Heslop's own report of the match, courtesy of "The Robins' Review". Thanks to George Heslop and Grahame Rowley. On a bright, cold and windy day, Altrincham's youngsters gave a generally competent performance. Despite their passing letting them down at times, they more than made up for this by closing down the opposition quickly. This led to Walton-Le-Vale being pressurised for the majority of the game. Altrincham started the game in a very dominant manner. As early as the 2nd minute, Levi Kennedy had a chance which was created by Mario Daniel and Paul Monaghan. The early pressure paid off in the 16th minute when Mario Daniel dispossessed the left back to break through and give the Robins a deserved lead. However, nine minutes later scrappy defensive work led to an equaliser by Walton. The response was good from the home team who hustled and hurried their opponents at every opportunity. This paid dividends in the 31st minute when Mario Daniel robbed the left back again, crossed to Adam Schofield and he made no mistake to make the score 2-1. The pressure continued and in the 42nd minute Adam Schofield turned well and forced the ball home off a defender to give Altrincham a 3-1 half time lead. The second half continued in much the same vein as the first with substitutes being introduced at various times. Then in the 72nd minute, Mario Daniel was involved in yet another goal when he burst into the box and was brought down. Paul Monaghan converted the penalty successfully to wrap the game up for the Robins. The game ended with the score at 4-1, still top of the table and still with a 100% record. The team was:- Newbrook, Leahey, Lewis, Howe, Claffey, Monaghan, Tilley, Kennedy, Schofield, Daniel & Crowther. Subs Wright (for Schofield), Delaney, Snagg (for Kennedy), Gilks (for Lewis) and Esdale.